Cafe Ba-Ba-Reeba is an amazing tapas restaurant. The Spanish red decor, with soft Mediterranean colors, and great traditional Spanish cuisine makes this dining spot a popular place to start your night out in Las Vegas. You will first notice Caf� Ba Ba Reeba's great location. It sits across the street from the Wynn Hotel and Trump Towers. You can choose to sit outside on the patio, where you will get a great view of the people and the lights or you can sit inside of the restaurant where you can enjoy that 'Spanish red' feel with soft candle lighting and cherry wood tables and booths. 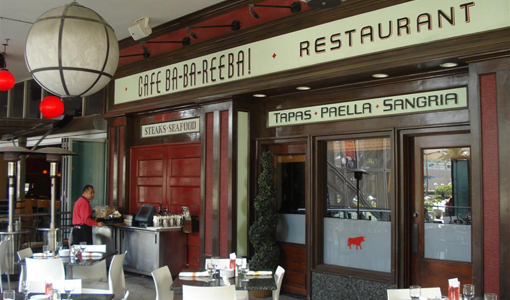 Although known for its great 'paellas', Cafe Ba Ba Reeba is better known for its Spanish 'tapas' (small appetizers) which can be served cold or hot. Their tapas menu is very extensive with everything from seafood to vegetables, or red meat to duck. You can't leave without enjoying a glass of their trademark sangrias, made overnight with fresh fruits and wine. A mixture of both tapas and pitchers of sangria can create the perfect meal for a friendly dining gathering. Patrons can also choose to have a traditional style meal featuring three different styles of Paella & unique entrees. Caf� Ba Ba Reeba has all the ingredients to begin your 'big night out'.